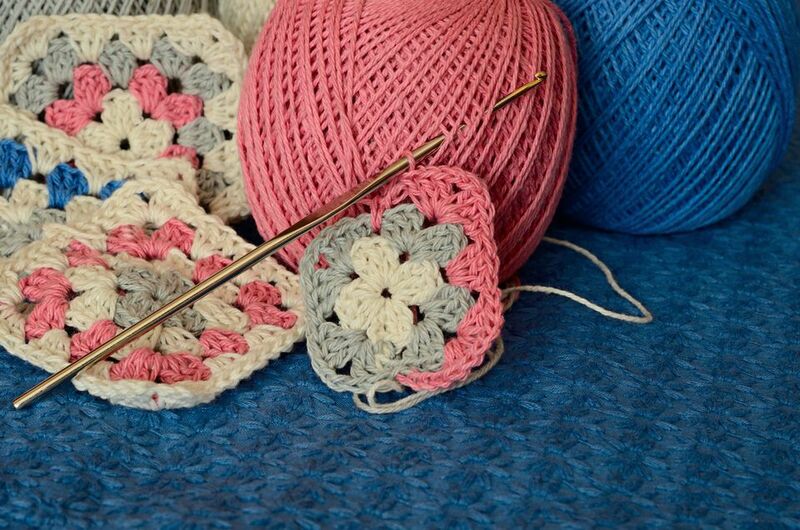 Over the years granny squares have become synonymous with crochet. They’re great for experimenting with colors and using scrap yarns. Granny squares also offer boundless design opportunity. For this pattern they’re arranged to form a groovy patchwork beanie style hat. To substitute yarn look for 100 to 150 yards each of 2 different colors in a heavy worsted or aran weight yarn. With Color B, ch 6, sl st in 1st ch to form ring. Rnd 1: Ch 6, [4 dc into center ring, ch 3] 6 times, 3 dc into center ring, sl st to 3rd ch sp of beg ch -- 7 groups of 4 dc. Fasten off Color B.
Rnd 2: Join Color A to the next ch sp, ch 3 (counts as 1st dc), 3 dc in same ch-3 sp, [4 dc in next ch-3 sp, ch 3] 6 times, sl st to top of beg ch -- 7 groups of 4 dc. Rnd 3: Sl st in top of next 3 dc, sl st in ch-3 sp, ch 3, 5 dc in ch-3 sp, ch 1, [6 dc in next ch-3 sp, ch 1] 6 times, sl st in stop of 1st ch-3 -- 7 groups of 6 dc. Rnd 4: Ch 2 (counts as 1st hdc), hdc in next 5 dc, 3 hdc in next ch sp, [hdc in next 6 dc, 2 hdc in next ch sp] 6 times, sl st to top of beg ch-2 -- 63 hdc. Rnd 4: Ch 3 (counts as 1st dc), dc in next 5 dc, 3 dc in next ch sp, [dc in next 6 dc, 2 dc in next ch sp] 6 times, sl st to top of beg ch-3 -- 63 dc. With Color B, ch 6, sl st in 1st ch to form a ring. Rnd 1: Ch 6, 6 dc into ring, [ch 3, 6 dc into center ring] twice, ch 3, 5 dc into center ring, sl st in 3rd ch sp of beg ch. Rnd 2: Sl st in next 2 ch sps, [ch 4, 6 dc tog over next 6 sts, ch 4, sl st in ch-3 sp] 4 times working last sl st in base of 1st ch-4. Fasten off Color B.
Rnd 3: Join Color A with sl st in top of next group of dc sts, [(3 dc, ch 1, 3 dc, ch 2, 3 dc, ch 1, 3 dc) in ch-3 sp of rnd 1, sl st in top of next group of dc sts] 4 times, work last sl st in same sp as 1st sl st of rnd. Rnd 4: Ch 2 (counts as 1st hdc), hdc in next 6 dc, 2 hdc in ch-2 sp, [hdc in next 6 dc, hdc in next sl st, hdc in next 6 dc, 2 hdc in ch-2 sp] 3 times, hdc in next 6 dc, sl st to beg ch. Rnd 4: Ch 3 (counts as 1st dc), dc in next 6 dc, 2 dc in ch-2 sp, [dc in next 6 dc, dc in next sl st, dc in next 6 dc, 2 dc in ch-2 sp] 3 times, dc in next 6 dc, sl st to beg ch. Arrange your crocheted pieces on a flat surface with the circular crown in the middle and the 4 squares spaced evenly around it. Thread a tapestry needle with Color A and sew one edge of each of the 4 granny squares to crown piece around its entire circumference. Thread tapestry needle with Color B and whipstitch together the adjacent sides of granny squares. Your work should now have proper hat shaping. Attach Color A to the bottom edge of hat. Sc in each st around the circumference of the hat.